The world’s obsession with physical beauty has led to a US$160 billion industry, with cosmetics accounting for $7 billion. And leading the cosmetic obsession is the need to enhance the appearance of eyes through eyelash extensions. Mascara alone accounts for six of the top 20 US cosmetic brands. But the world’s vain obsession with eyelashes has failed to address the basic question concerning their purpose: why do we have eyelashes? Do they serve a purpose? These distinct hairs are ubiquitous and surround one of our most sensitive organs but very little is known about them. Their mystery motivated our investigation, published in the Journal of the Royal Society Interface. In our study, we found that eyelashes protect our eyes from drying out and accumulating airborne particles like dust and pollen. Across mammals, eyelash length is tuned to one-third the eye opening width to minimise airflow reaching the surface of the eye. Our study started in the American Museum of Natural History in New York City with access to their vast collection of preserved animal pelts. We spent a week among the pelts meticulously measuring the length, width, and density of their eyelashes and the width of the slit exposing the eye. In total, 22 mammalian species were measured, spanning four orders of magnitude in body size. It ranged from a hedgehog weighing 0.5kg, to a giraffe weighing 500kg. These measurements showed a peculiar relationship. As their eyes became larger and more exposed, their eyelashes increased in length. Specifically, the length of eyelashes was one-third of the opening width of eyes. This size constraint led to the hypothesis that eyelashes may indeed serve a useful function. 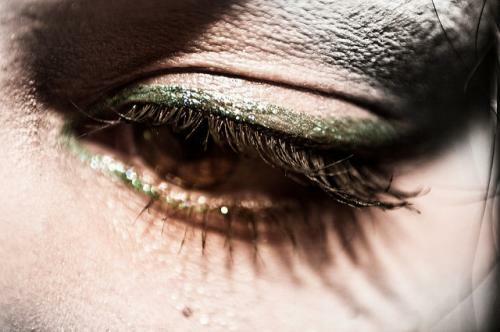 So why are eyelashes one-third of the eye opening width? Being mechanical engineers by training, and specifically focused on the study of fluid mechanics, we wanted to understand how eyelashes interact with surrounding airflows and how lash length affects this interaction. Does this eyelash length help protect our eyes from airflow and the airborne particulates that may deposit? Using an old desktop cooling fan, thin aluminium sheeting used for street signs, and honeycombed metal sheets, we constructed a small wind tunnel capable of reproducing the airflows our eyes typically experience when we walk. To mimic a human or mammalian eye, we used a small dish filled to the brim with water and surrounded by either commercially available false eyelashes or a synthetic mesh with similar porosity. The surface of the water mimics the wet surface of the eye, and using a high-precision scale, we measured the evaporation rate of the water. This rate indicates how fast our thin tear film vanishes, and the frequency of our blinks, which replenish the film and keep our cornea hydrated. By using the eye and eyelash replica, we were able to test eyelash lengths outside of those found in nature. From our experiments we found that the eyelash length we measured on mammals was the length that minimised the evaporation rate of our eye mimic. These results indicate that the natural length of eyelashes is tuned to help protect our eyes from drying out and minimise the amount of times we have to blink. To test if eyelashes could also help protect our eyes from airborne debris, we modified our wind tunnel and eye mimic. We attached a humidifier to our wind tunnel in order to inject a stream of water drops, which are of the same size as particles like airborne dust and pollen. Our liquid eye mimic was replaced by an absorbent paper disk that we use to catch the incoming water drops. The water we used in our humidifier was combined with a green, fluorescent dye so that any of the small drops that deposited onto our eye mimic could be easily detected by the change in colour. From these experiments, we found that the particular eyelash length found in nature, or one-third the eye opening width, minimises the total amount of airborne debris that reaches our eye surface. In other words, our eyelashes not only help protect our eyes from drying out, but also from accumulating dirt. From our study, we found that eyelashes of a particular length can protect our eyes. When lash length exceeds the optimal length of one-third the eye opening width, we find that our eyes dry out faster and accumulate more dust. We used computer simulations to find out why this occurs. From our simulations, we found that when eyelashes are longer they actually channel more air towards our eye’s surface. Shorter eyelashes resist incoming airflow and create a zone of stagnant air above our eye surface. By minimising the airflow that reaches our eye surface, eyelashes can protect our moist, delicate eyes. Our study demonstrates that there is usually a reason why nature is the way it is. Millions of years of evolution have led to the success of the best designs. By altering or modifying nature’s design, we may be putting ourselves at a disadvantage. Beauty comes at not only a monetary cost, but sometimes even at a cost to our own health and well-being.